The Norfolk Medieval Graffiti Survey (NMGS) was established in early 2010 as an entirely volunteer led community archaeology project. 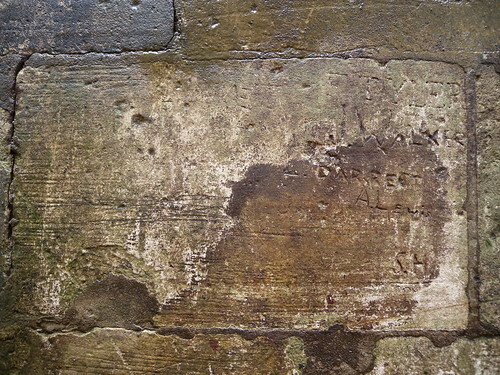 Its aim is to undertake the very first large-scale systematic survey of medieval churches to identify and record pre-reformation graffiti inscriptions. Although the NMGS is a community archaeology project it aims to undertake surveys, recording and cataloguing to the highest professional standards. The project records all of its result with the church authorities and the local Historic Environment Record (HER) – thereby ensuring that the work will be available for generations to come. The NMGS is also strongly committed to publishing its findings and making them available to the wider archaeological community. All the survey work is undertaken by volunteers. Volunteers are drawn from all age groups and backgrounds—and no prior experience is needed. The Norfolk Medieval Graffiti Project is a chance for real people to make a real difference and be part of a groundbreaking historical project. To learn more visit the project website. What might be found in London? A recent article on the Spitalfields Life website described the graffiti recorded at the Tower of London, and during TDP fieldwork at the Tower Beach we have recorded graffiti on the riverside wall too – as you can see in the picture below, and masons marks on the walls at Greenwich. Who knows what might else be revealed during a close inspection of the riverside walls of the Thames?